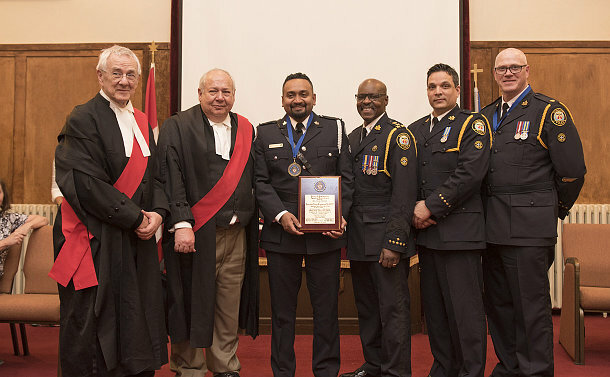 As Constable Niran Jeyanesan was introduced for a Community Award at the 19th annual St. James British Methodist Episcopal (BME) Church/Toronto Police 13 Division Black History Month (BHM) celebration, the audience rose to its feet to applaud. Last August, the 31 Division officer thought he was responding to a routine shoplifting call at a Walmart store in his Division. When he showed up, the 18-year-old told the officer that the long-sleeved shirt, a tie and pair of socks that he allegedly had attempted to walk out of the store without paying for were meant for a job interview. The teenager told the officer he didn't have money to buy the clothes and he desperately needed a job. Empathizing with the young man’s plight, Jeyanesan bought the clothes which the teenager wore to a job interview and was able to secure full-time employment. Nearly six months later on February 25, his good deed resonated with the audience at the church, there to honour their first-responders, many of whom were hearing about it for the first time. The officer has remained in contact with the teenager. “He’s doing well in his job and is taking care of his ill father,” said Jeyanesan. “They are living in a small room at a friend’s home and I am in the process of helping him to get an apartment. He doesn’t have a credit history or reference, so it’s tough for him to go out on his own and get these things. I am talking to some people and, hopefully, he will be able to get a place soon. With the support of 13 Division and the BME church, now-retired Toronto Police officer Ojo Tewogbade launched the BHM celebration to recognize professional and community service achievements. Awards were presented to Sergeant Fred Kozar, Constables Michael Avelar, Gurpreet Pannu, Jamie Pardy, Mark Gray, Auxiliary Officers Frank Dileo, Jean-Pierre Samaan, Ashley Horgan and Court Officer Dolapo Maxlino. 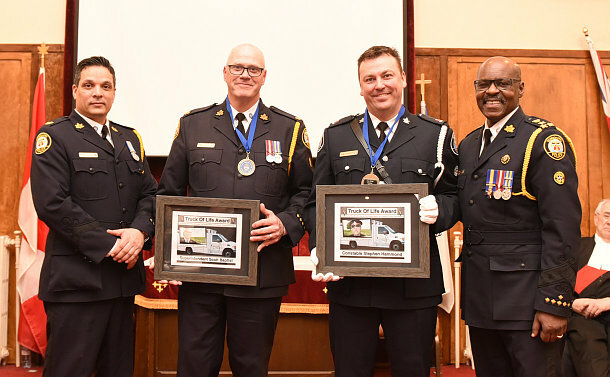 Step by Step, a non-charitable organization committed to promoting organ and tissue donations, made a special presentation to Superintendent Scott Baptist and Constable Stephen Hammond of the Chief’s Office, for the roles they played after the organization’s audiovisual van was torched by vandals last September.